It is difficult to find anything comforting when you are told that you have cancer. Perhaps no word evokes more terror, and this is not without reason. By the time that 2017 ends it has been estimated that 1.7 million people in the US will be diagnosed with cancer and 600,000 will die. Even with advances in treatment, such as immunotherapy, The chances of dying from all types of cancer are still disturbingly high. With one exception: testicular cancer. For reasons that will become clearer as you read on, the cure rate in men whose cancer has not spread is an astounding 99%. Perhaps more impressive is that even when the cancer has metastasized to the lymph nodes in the abdomen, the five-year survival ranges from 73-96% depending on the extent of metastasis. This puts testicular in a class by itself. But, why? The biology of germ cells is a bit above my dismally low pay grade, so my colleague Dr. Julianna LeMieux will explain what's going on in her companion piece here. Instead, I will explain why it is no accident that the drug of choice is cisplatin. That's the bad news. Because cisplatin, although it works, quite well is one god-awful drug to take. Chemotherapy drugs are classified by their emetogenic potential - the propensity to cause vomiting (Table 1). Lists that group chemo drugs by emetogenicity are easy to find. Cisplatin does not do well here. Table 1. 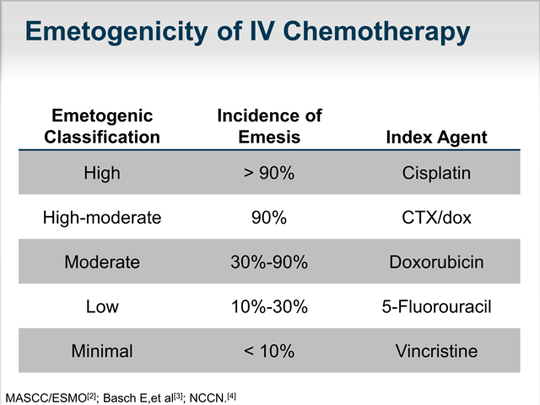 Emetogenicity of selected IV chemo drugs. Source: Medscape. The incidence of vomiting (90%) is in the absence of antiemetic drugs such as Zofran. They help a lot. The reason that cisplatin is useful against testicular cancer is the same reason that it is so toxic. The drug is an intercalator (1); it fits into certain spaces (called grooves) in the DNA double helix and damages it. By definition, drugs that act as intercalators are genotoxic; they damage DNA. Cisplatin may be unpleasant to take but it is a great teaching tool. It would be difficult to find a better example of the power of intercalation than cisplatin. The molecule is perfectly "engineered" not only to fit into DNA but stay attached to it, which disables the various DNA repair mechanisms (for an explanation of how this works, see Dr. LeMieux's companion piece). Figure 1 shows the structure of cisplatin and a simplified view of the intercalation process. The simple chemical structure (left) and ball and stick model (middle) both show that the drug is flat (planar), which is very unusual for drugs (Figure 1). It is this planarity that gives the drug its particular qualities: the ability to easily insert itself into the spaces that exist in DNA (right).The orange arrows depict the intercalating agent. Figure 1. Cisplatin: The green balls are chlorine atoms and the blue balls are nitrogen atoms. Photos: Adapted from 3DChem and Wikipedia. Cisplatin sure looks like a good intercalator geometrically, but you've only seen part of the reason for its effectiveness. The rest can be explained by simple (more or less) organic chemistry. Figure 2 shows a model of cisplatin bound to DNA. The platinum atom (orange circle) remains attached to two nitrogen atoms (blue spheres) but the two chlorine atoms (green in Figure 1) are gone. And it looks like the cisplatin is now attached to DNA where the chlorine atoms once were. It is this irreversible attachment, which accounts for the extreme genotoxicity of cisplatin. Figure 2. The attachment of cisplatin to DNA. The pale orange circles show the spaces between DNA strands where molecules can fit. Photo adapted from atdbio. Let's look a bit closer. Figure 3 shows the reaction at the atomic level. In the figure on the left, we see cisplatin positioned so that the platinum atom is sitting in just the right position to form a bond to the nitrogen atom of guanine (1). When there is another guanine molecule present in the right position, this reaction happens twice. Result: The two guanine molecules are both covalently bound to one platinum. This is called cross-linking - the binding of two different sections of DNA. These sections may be on the same strand or another. Either way, it messes up the DNA but good. Figure 3: The reaction of cisplatin and DNA (right) The bond that will form is the red hatched line. The product of the reaction (left) now contains two platinum-nitrogen bonds. It is not often when you can look at a drug and its target in such detail and clarity. This is as good a demonstration of chemistry and biology working together as you'll ever see. (1) This is only partly true. Yes, cisplatin is an intercalator, but it packs a double punch. Once the drug enters the DNA groove it stays there by the formation of a carbon-platinum bond (Figure 3). (2) There are four different nucleotides that make up all of DNA: A (adenine), T (thymine), C (cytosine) and G (guanine). Cisplatin prefers G. You don't want to know why.